Randy Emberlin has spent the past 30 years working in a variety of creative fields. Whether as an illustrator of educational books or an animator on over 50 television commercials, he has made his presence felt through style and sensibilities. Over the last 20 years he is probably best known for his work as an inker in comics, with a resume that includes long runs on Amazing Spider-man, GI Joe, Doctor Strange, Alien Legion, Ghost and recently the Left Behind series for Wildstorm. He has worked with a wide range of pencilers and has many distinctive styles that fans are well acquainted with. Randy also teaches After School Drawing Classes for students in the greater Portland and Beaverton metropolitan areas. This year, in July, Randy will also teach three Cartooning and Comic Book Summer Art Camps. He currently resides in Portland Oregon with his wife and two children. Randy is more than happy to sign books or send autographs. Please Contact him by email. Thanks! Inks on Alien vs. Predator “Thrill of the Hunt” Darkhorse pocket book. 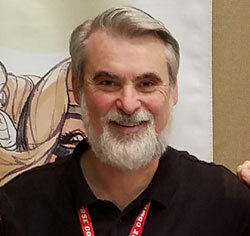 See Randy at the Wizard World Comic Con, February 22-24, 2019, Randy is appearing in Artist Alley at Table #1440. From Stick Figure to Superhero in four minutes. An excerpt from Randy's "The Art of Comics" assembly presentations. The video clip demonstrates the process of starting from early stick figure sketches to layout drawings and finally to finished pencils and inks. If you would like Randy to do a commissioned piece for you, see the ordering information on Randy's Gallery of past commissions and artwork.